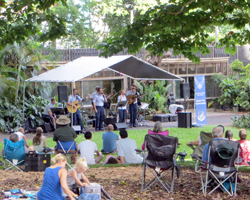 Free Twilight Summer Concert Series at Foster Botanical Garden. 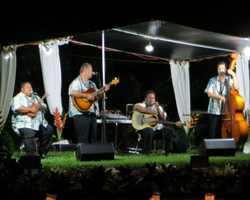 The Twilight Summer Concert Series at the Foster Botanical Garden is a perfect way to enjoy Hawaii’s ideal summer climate, lush tropical beauty, and fun Honolulu entertainment – all for free! Throughout the months of June and July on Thursdays, this annual Hawaii activity features new performers each week (often, but not exclusively, of the brass band genre). Free entertainment sets a much better mood than the normal traffic noise that normally surrounds the garden. 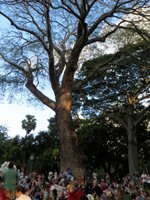 Foster Botanical Garden contains 24 trees that have been designated “exceptional” by the County Arborist Committee – nearly a quarter of all such trees on Oahu! Many of these trees were planted in 1853. 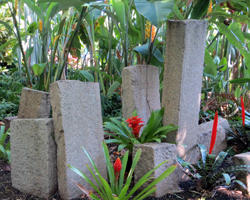 A pleasant self-guided walking tour of the various Foster gardens will reveal exotic orchids, heliconia and ginger, the prehistoric glen (featuring primitive plants from around the world), and an open-air butterfly garden. Free things to do in Honolulu mean you can plan cheap Hawaii vacations! In all honesty, I don’t get to enjoy these Hawaii special events nearly as frequently as I might like, because I work on another part of the island and seldom finish early enough to attend. But if you’re on vacation and/or working in Honolulu, one of these concerts is an easy Hawaii event calendar activity for you! Just bring your own lawn chairs or blankets and relax to the smooth sounds in Honolulu’s urban piece of paradise. For complete details, see the official Twilight Summer Concert Series calendar (link opens a new window/tab). As a sort of finale to the Twilight Summer Concert Series, Foster Botanical Garden also hosts a free “Midsummer Night’s Gleam” Saturday family night, complete with concert, dancers, a lion dance, children’s activities, and more! 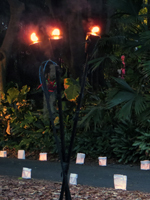 The gleam refers to the hundreds of luminaries that line the trails throughout the garden. This event is very well attended; and it is definitely intended to be family-friendly fun. 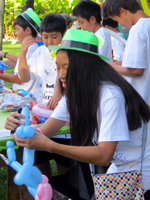 When my family went, the children’s activities included a painting area, balloon animals, archery, fencing, storytelling, and a “haunted” garden. 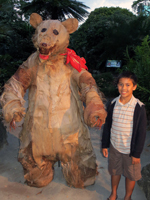 In addition, scattered around the garden were several impressive, life-size animals made from plant materials. My kids had a great time. And the adults enjoyed getting to relax and picnic in the garden. General (ages 13 and up): $5. Kamaaina (ages 13 and up): $3. If crowds will detract from your enjoyment of the garden, go at a different time and pay the normal admission (see sidebar at right). Just remember that you’ll still have plenty of adjacent traffic noise, so it’s never going to be a true retreat into nature. If, however, you’re specifically interested in the experience and free entertainment, then by all means go and have a good time! The crowds did not detract from my appreciation of the garden at all – and I saved a few bucks! That’s a win-win as far as I’m concerned.